Register Today! Open to the first 100 riders! 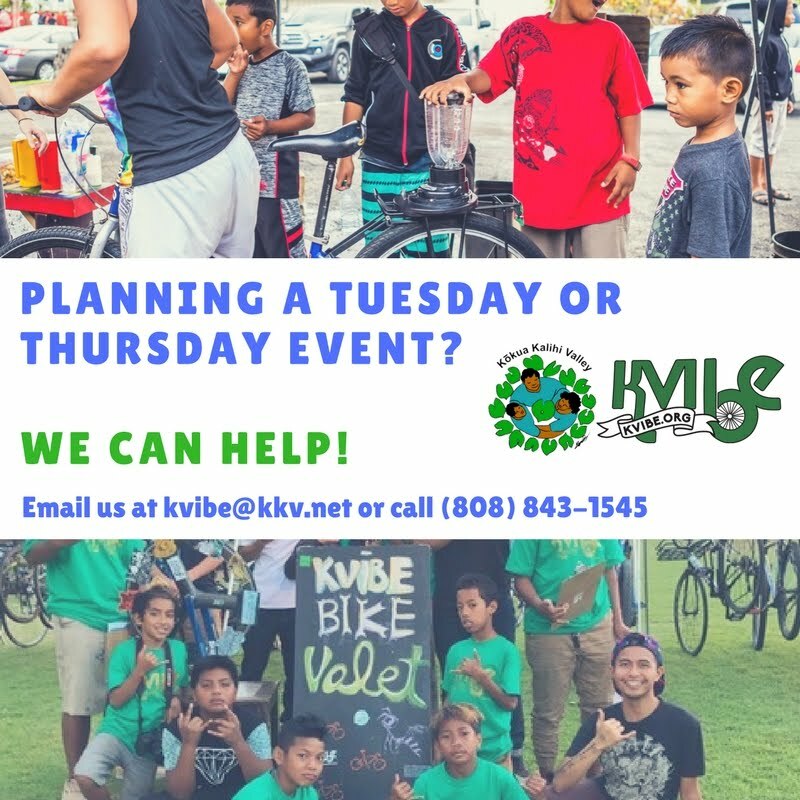 The Kalihi Valley Instructional Bike Exchange (KVIBE) is a nonprofit bicycle education program/shop that promotes bicycle-related activities for Kalihi Valley. KVIBE uses bicycling to promote physical and emotional well-being by fostering health and sustainable relationships between youth leaders, the community, and the land. Designed to address the need for a safe, healthy, and educational environment for the youth in Kalihi Valley, KVIBE provides the communityʻs children with positive pursuits, mentoring, and community role models. An ahupua’a is a traditional Hawaiian land unit that followed watershed systems extending from mountain to ocean. The ahupuaʻa system of land division helps Native Hawaiians and those who call Hawaiʻi home sustainably manage resources for our communities today and well into the future. What is the Kalihi Ahupua’a Ride (KAR)? The KAR is an educational ride that leads riders through the Ahupuaʻa of Kalihi. 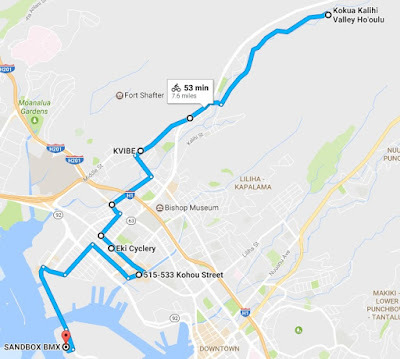 It makes important “Story Stops” at important locations where riders can learn about the cultural and historical significance of each place and its role in the changing face of Kalihi. The KAR is designed to uplift community spirit by offering the general public information on health resources, nutritious food access points, cultural and historical knowledge about Kalihi, and instilling a sense of pride for those who call Kalihi home. Anyone interested in learning about the story of Kalihi that is not popularly known is welcome to participate. Whether you call Kalihi home or not, from keiki to kūpuna. All are welcome to participate! We are only registering 100 riders this year. Safety is our priority! All participants are required to bring a bike with functioning breaks and wear a buckled and properly-fitted helmet when bicycling. We will provide recommended bike safety workshops for those who arenʻt familiar with riding a bicycle on the road and lead a 10-minute mandatory bike safety debriefing before the ride. The road going into Kalihi Valley can be very steep! All children under 16 years of age must be accompanied by an adult. What does the route look like? Below is the map of the KAR Route. We will start at Ho'oulu 'Āina and end at BMX Sand Box. What do sponsorships pay for? Aside from being an educational ride, KAR is also a fundraiser designed to raise funds that will be equally distributed amongst the various Youth Programs at Kōkua Kalihi Valley! Various community sponsors have made contributions of various amounts to make this ride possible! By participating in KAR you are also helping to continue valuable programs to Kalihi Valley youth. All you have to do is ride! 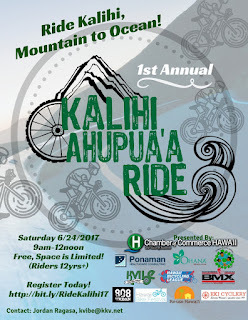 To make a personal donation to the Kalihi Ahupuaʻa Ride, visit our generosity.com page by clicking here. ***KKV is recognized as a 501(c)3 tax-exempt organization by the IRS and is eligible to receive tax-deductible contributions. We will mail you a written acknowledgment of your sponsorship donation. To apply for a sponsorship, visit our generosity.com page here or fax/mail a sponsorship application by downloading an application here. For more information on sponsorships, please contact our Community Outreach Coordinator, Jordan Ragasa, at jragasa@kkv.net. Click here to download a poster! Mahalo to the Chamber of Commerce Hawaii for their generous contribution! I'll bet you won't guess which muscle in your body is the muscle that gets rid of joint and back pains, anxiety and burns fat. If this "hidden" highly powerful primal muscle is healthy, you are healthy.